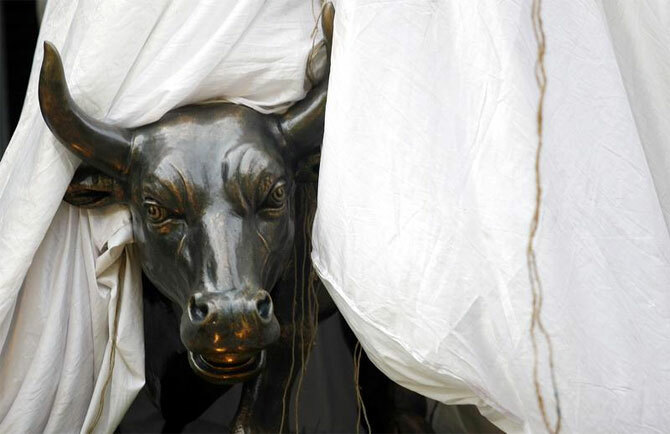 The 30-share Sensex ended lower by 46 points at 27,842 and the 50-share Nifty slipped 17 points to trade at 8,378. Benchmark indices ended lower amid choppy trades weighed down by IT shares after the rupee recovered against the US dollar along with index heavyweights such as HDFC and RIL. Markets are expected to consolidate gains this week and investors would take cues from earnings with Infosys kicking off the December-quarter result season on Friday. However, broader markets outperformed the benchmark indices- BSE Midcap and Smallcap indices were up 0.1-0.2%. The market breadth in BSE ended positive with 1,563 shares advancing and 1,271 shares declining. Meanwhile, foreign institutional investors were net buyers in equities to the tune of Rs 260 crore on Friday, as per provisional data released by the Bombay Stock Exchange. According to Nomura report, a gradual recovery is underway for the Indian economy and the country is expected to clock a GDP growth of 5.5% in the current fiscal and 6.6% in FY16. At 15:35 PM, the Indian rupee was trading lower at Rs 63.30 compared to its Friday close of Rs 63.30 due to rise in the greenback’s value against other currencies overseas. BSE Auto, Consumer Durables and Capital Goods indices surged over 1%. However, BSE IT and TECk indices slumped over 1%. Capital Goods stocks gained on robust PMI data for the month of December which was at its highest since end-2012. Larsen and Toubro gained around 2% after the company said it has won orders worth of Rs 4,006 crore in the month of December 2014. Also, Citi upgraded L&T stock to buy from neutral citing an expected turn around in the company's defence manufacturing business on the back of large defence orders the company has received. The stock is up 2%. Auto stocks started the week on a robust note as the release of sales volume data for the month of December has commenced. Tata Motors gained around 2.5%. On Friday, Tata Motors reported a 10% increase in total sales at 41,734 units in December, as against 37,836 units in the same month last year. Maruti Suzuki was the top Sensex gainer, up around 2.7%. The company reported 21% growth in sales during December 2014 compared to the same month last year. Also, CLSA has retained Maruti Suzuki as top auto pick in 2015 citing new products, improvements in pricing and large margin expansion of yen among other factors which are likely to help the company to reap larger profits in 2015. Financials were trading mixed post the two-day banking retreat. ICICI Bank and Axis Bank gained 0.6% and 0.4% each. Morgan Stanley maintains an "overweight" on Axis Bank. Axis Bank and ICICI Bank gained marginally. HDFC twins shed between 0.2-2% and SBI ended lower by 0.8%. In a release to BSE, SBI has said that United Forum of Bank Unions (UFBU) has given a notice to Indian Banks'' Association calling for nationwide Bank strike, on the 7th and 21st to 24th January 2015. Coal India is transporting extra volumes of coal to power plants ahead of a five-day worker union strike that threatens to cut much of its per-day output of 1.6 million tonne, two company officials told Reuters on Monday. The stock ended 1% lower. Bharti Airtel was the top Sensex loser, down almost 3%. Other prominent losers were Dr Reddy’s Labs, Hindalco, Sesa Sterlite, TCS, Infosys and BHEL. The euro hit a nearly nine-year low versus the dollar on Monday as investors bet on quantitative easing by the European Central Bank while soft manufacturing surveys pushed down shares and sent oil prices to 5 1/2-year lows. Japan's Nikkei fell 0.2% on the first trading day of the year. Chinese shares, however, maintained their bullish tone since last year on hopes of more stimulus, as property shares jumped on local media reports saying mortgage restrictions had been relaxed.